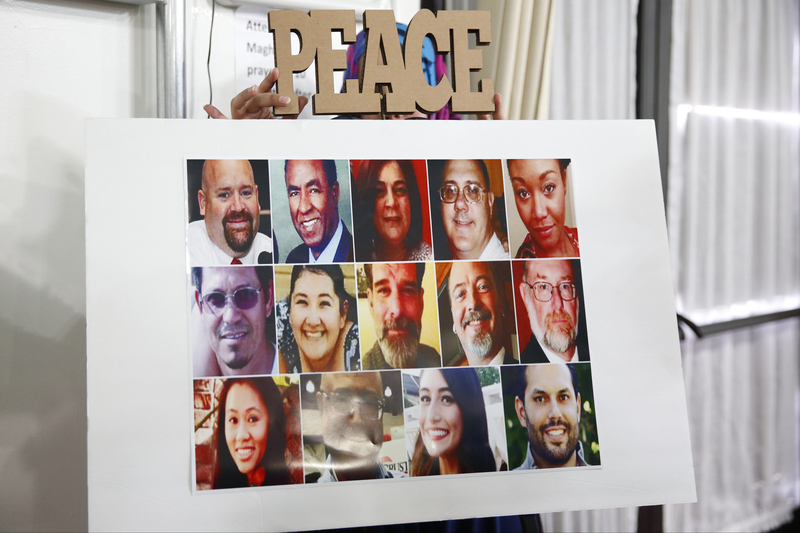 WASHINGTON -- Some family members of victims and survivors of the San Bernardino attack will file court papers in support of a judge's order that Apple Inc. help the FBI hack into a locked iPhone as part of its investigation, a lawyer and others say. The victims "have questions that go simply beyond the criminal investigation ... in terms of why this happened, how this happened, why they were targeted, is there anything about them on the iPhone - things that are more of a personal victim" view, Larson said. Robert Velasco, whose 27-year-old daughter Yvette Velasco was killed in the shooting, told The Associated Press that he didn't have to think long before agreeing to have his name added to the legal filing in support of the FBI. "It is important to me to have my name in there," Velasco said. "I lost my daughter in this and I want the court to see that I am seeking justice for my daughter." Velasco said the phone could reveal other extremist plots or that other people were involved in planning the San Bernardino attack. "The only way to find out is to open up that phone and get in there," he said. "A lot of the families of the victims, we're kind of angry and confused as to why Apple is refusing to do this." The appeal from victims' family members gives the Justice Department additional support in a case that has sparked a national debate over digital privacy rights and national security interests. Magistrate Judge Sheri Pym ordered Apple last week to assist investigators by creating specialized software that would let the FBI rapidly test random passcode combinations to try to unlock the iPhone and view data stored on it. The county-issued iPhone 5C was used by Syed Farook, who with his wife, Tashfeen Malik, killed 14 people at an office holiday party in December before they died in a gun battle with police. The government said they had been at least partly inspired by the Islamic State. What could clash over San Bernardino killer's iPhone mean for Apple's brand? White House spokesman Josh Earnest said Monday that the FBI's request is "quite limited in scope" and called it "an effective way for the FBI to follow their regular procedure as they conduct this independent investigation, but also stay true to the kinds of principles that the president has discussed publicly about the need for robust encryption methods." Earnest said the sides needed to hash things out in court and questioned whether Congress - as Apple and others have suggested - would be an effective medium for solving issues evoked by the court order. Farook had worked as a county health inspector. Larson said the government has a strong case because of Farook's diminished privacy interests as a "dead, murderous terrorist" and because the phone was owned by his employer, the county government. "You're weighing that against the interest of enforcement in an investigation and the victims and their interest in obtaining this knowledge," he said. Apple Inc. CEO Tim Cook has said that creating such software is a dangerous precedent that would threaten data security for millions by making essentially a master key that could later be duplicated and used against other phones. On Tuesday, former Solicitor General Ted Olson, who is representing Apple, said the company has invested heavily to design a secure phone and that if Apple submits to the government pressure in this instance, "it will happen again and again and again." Olson served as the government's top lawyer before the Supreme Court during the administration of President George W. Bush. "We have a constitution and we have civil liberties in this country. Terrorists want to take that away from us," he said in an appearance on "CBS This Morning." Gregory Clayborn, whose 27-year-old daughter, Sierra, died in the attack, said he hasn't been asked to join the case but believes Apple is obligated to unlock the phone. "This makes me a little bit angry with Apple," Clayborn said. "It makes me question their interest in the safety of this country." Clayborn said he understands Apple's concerns, but unlocking one phone for the FBI, he said, is "as simple as it gets." Facebook CEO Mark Zuckerberg on Monday expressed his support for Apple while in Barcelona, Spain, to speak at the Mobile World Congress, saying he believes in helping the government in its fight against terrorism but that encryption is important. "I don't think that back doors into encryption is going to increase security or is in the direction the world is going," he said. However, Microsoft founder Bill Gates is siding against Apple - and many other technology companies - in saying the firm should help the U.S. government to hack into the locked iPhone. In an interview with the Financial Times, Gates took the position of the government, denying the case would set a precedent. "This is a specific case where the government is asking for access to information. They are not asking for some general thing, they are asking for a particular case," the newspaper quotes Gates as saying. Gates also told the Financial Times that, as the newspaper put it, there are "benefits to the government being able to enforce taxation, stop crime and investigate terror threats, but said there must be rules on when the information can be accessed." Apple's supporters planned to protest the FBI's demands on Tuesday evening outside Apple's stories in about 50 cities in the U.S., the U.K., Germany and Hong Kong. A Pew Research Center survey found that 51 percent of Americans said Apple should unlock the iPhone, while 38 percent said Apple should not - and that it should ensure the security of user information. The remainder gave no opinion. The telephone survey was conducted Feb. 18 through Feb. 21 among 1,002 adults.